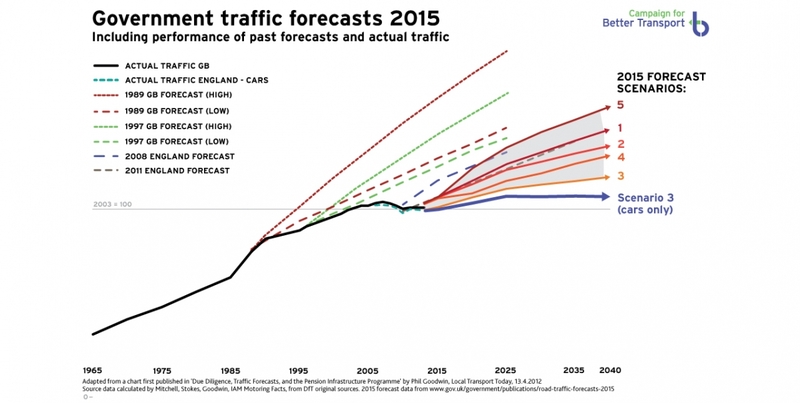 Some welcome changes have been made to the latest traffic forecasts from the Government, but their models still urgently need to be updated and opened up. The Department for Transport's new Road Traffic Forecasts  have been published, and we're pleased to see a few steps towards the 'scenario' approach we have been advocating for a long time, alongside many academics and experts. "There is inevitable uncertainty in any projection. A useful approach is to adopt scenarios, rather than a central case with sensitivities. One scenario might correspond to the Department’s central case. Another might reflect the peak car perspective." The DfT hasn't wholeheartedly embraced the concept. Instead of looking at the way a range of factors might interact (including Government policies) to cause different traffic levels in future, the changes made are more like a simple 'sensitivity test' of a couple of variables. However, it is good to see any changes at all filtering through the notoriously conservative world of modelling, and to see influences outside economics being considered, especially in the light of past forecasts being so inaccurate and the 'peak car' debate . You can see what they have done in the table below. Instead of a simple set of high and low bounds, controlled only by macroeconomic factors like GDP, population and the price of oil, the five separate scenarios have also factored in a reduced dependence of driving behaviour on income, and one scenario also looks at what happens when the number of trips made per person continues to follow the current falling trend. The resulting forecasts from the new scenarios are shown below – plotted as a continuation of the excellent analysis done on previous forecasts by Prof Phil Goodwin (read about this here ). 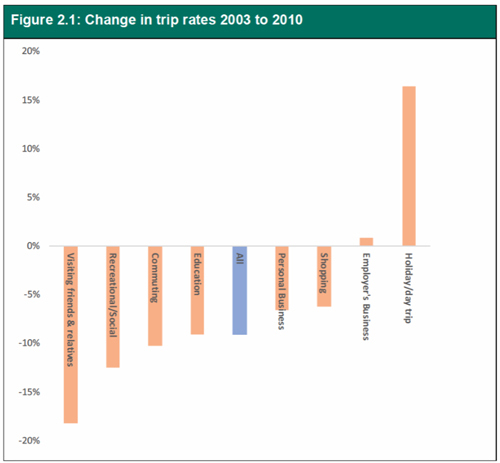 What's especially interesting about Scenario 3 (the one which includes continued falling trip rates) is the effect on car travel after 2025. In this scenario, the trend for car traffic is more or less flat after 2025, opening up all kinds of possibilities for policy initiatives that might actually reduce traffic and congestion. This is a much more optimistic future than the decades old 'predict and provide' philosophy, which warns about imminent gridlock and builds new road capacity that will – at best – only make the future situation a little less bad. It's certainly the first time I've ever seen a traffic prediction from the government that acknowledges the possibility of any kind of equilibrium! Many flaws clearly still remain in the methodology. The inputs to the model continue to assume fuel prices will level off and carbon emissions from road transport will rise after 2030, even though we know most of the remaining oil reserves have to be left in the ground if we're to avoid catastrophic climate change . And nothing has been changed to reduce old problems such as the lack of land-use planning variables and assumptions about increasing driving rates as people get older. The treatment of other modes is also very simplistic. For example, no account is taken of increases in rail capacity, and the tables of results by vehicle type show a big decline in the number of buses by 2040 (around 20 per cent). I suspect the same is again true of cycling, although this mode isn't even reported and we'll have to ask for the details as CTC did last year . Finally, the changes made have only been applied to car trips, leaving forecasts for vans and HGVs to remain as more or less simple extrapolated trends. This is despite huge investment being made to switch freight from heavy lorries onto rail , and the inherent lack of logic in assuming increased van deliveries (again it seems largely due to internet shopping) will continue to increase indefinitely. This prediction makes no sense at all: even if cities fail to act with measures such as consolidation centres, any logistics companies worthy of the name would start combining van deliveries long before we got to the situation predicted by the forecasts, even if purely for reasons of business common sense! Finally, we know the DfT's current model of the transport network and demand for motor travel is creaking in its methodology, but it's also increasingly outdated in terms of technology too. A full run of the model takes weeks as it uses a wide range of different software programs, cobbled together into something that cannot be rapidly tweaked or run repeatedly to experiment on the effects of different factors. It will need renewing soon and, when it is, we hope that the DfT will make it much more open to scrutiny, examination and testing by academics and other researchers. Alongside London Cycling Campaign, Open Rights Group and Involve, we asked for the same thing recently from Transport for London, whose models have held up schemes to increase road space for cycling and buses in recent years. In our joint response to TfL's consultation on transparency  our groups ask for much more data to be made available to researchers, campaigners and the general public, and for a register of research to be kept up to date, with plans and results available for all to see. Our letter also asks for TfL's transport model of London to be opened up to scrutiny as soon as possible. One example we give of when a more open approach would have been helpful is when the TfL model calculated a £200 million cost disbenefit for the new segregated cycle routes through central London, resulting from very large predicted delays to long car journeys through central London . "The modelling has often been too pessimistic in the past and you can see that by what it predicted compared to what has actually happened. It predicted, for instance, that the abolition of the Western Extension to the Congestion Charge Zone would cause between 8% and 12% more traffic in the Zone and a rise of 15% to 21% in congestion. The actual rise was 6%. It predicted a drop in traffic speeds of 6% to 12%. The actual drop was 3%." Along with the small steps taken by the DfT this month, we hope that we're finally making progress on this crucial issue towards better and more open transport models, which could soon be the foundation of a much better future transport policy.